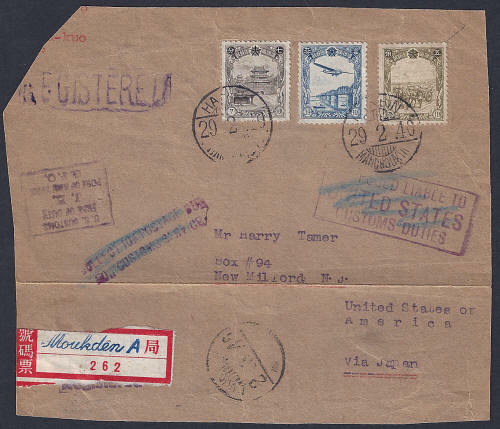 This cover was part of a collection owned by Franklin D. Roosevelt (January 30, 1882 – April 12, 1945) 32nd President of the United States and a keen stamp collector. Roosevelt died in office in 1945 and Harmer's sold his collection by auction in New York in 1946. The red hand stamp of authenticity was applied at this time. Sadly in the case of this cover someone has removed the consular seals. This collection was vast and so finding examples is not as rare as you might think. 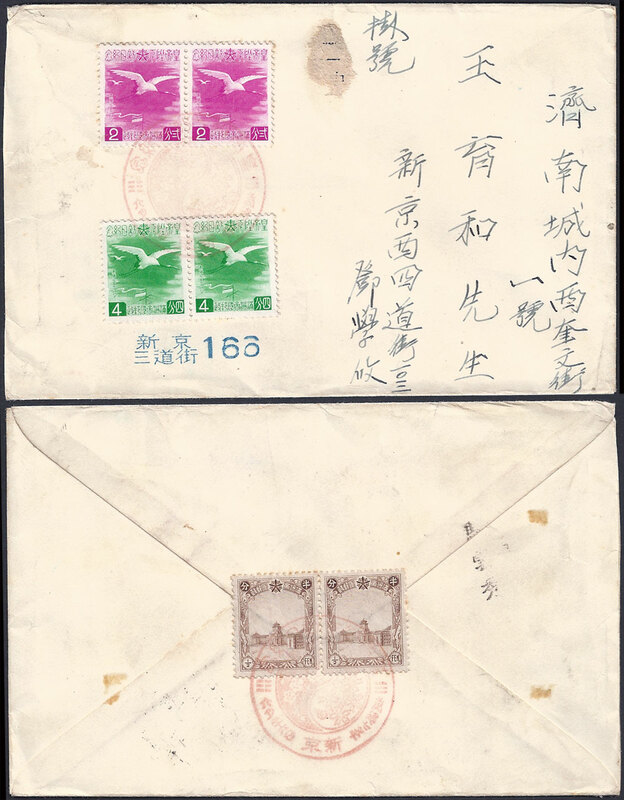 The cover was posted from 奉天三經路 Mukden Third Road Post Office on 11th November 1940 where it received a poorly applied native postmark. From there it was transferred to Mukden Central Post Office where the Registration label 203 and the international postmark were applied. The cover continued its journey on 13th November 1940 and arrived in Chicago Dec 9 1940 and finally in Washington on Dec 10 1940 a transit time of 30 days. The postage applied to this cover amounts to 72 fen. This is correct. The letter rate was 20f + 16f for registration, this is a large envelope so the remaining 36f is made up of 3 x 12f excess weight payments indicating that the total weight for the letter was no more than 80g. This card was returned to the sender due to insufficient postage. The card was addressed to North China Expedition, Hasegawa (Gi) Unit, Kubozoe Unit, Usui Unit, Mr. Takeuchi Shirou, presumably in China. From the postmark the card seems to have been posted from Yingkow. At this time, 8th August 1940 the postage for a postcard to China was 2½f, a deficiency of ½f, this resulted in the post office returning the card to the sender with the attached slip. 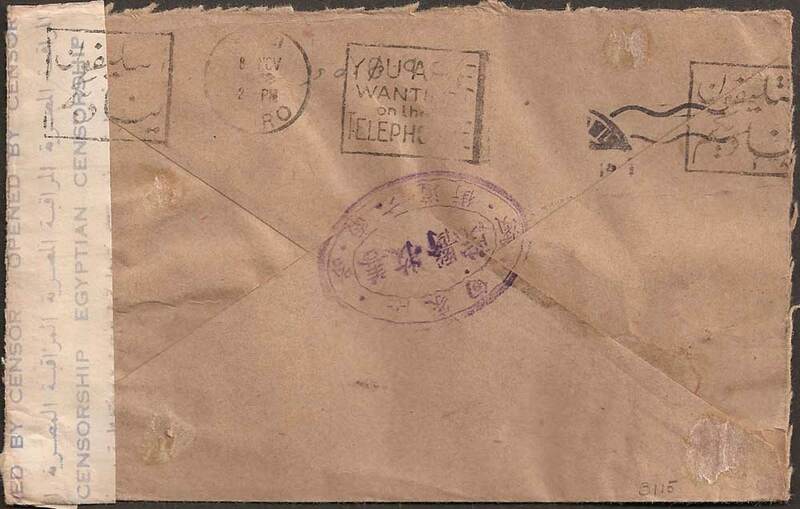 This letter was posted from the Mudanjiang by the 24th Military based in 隹木斯 Jiamusi to 名古屋市 Nagoya in Japan. 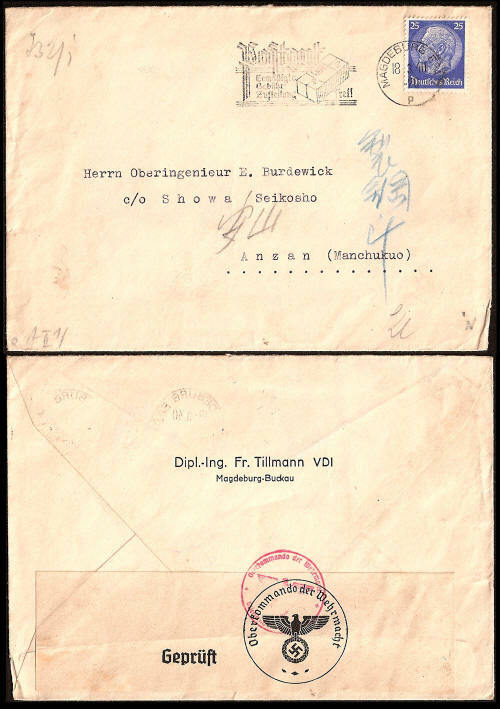 Top left in red is the standard Military Post hand-stamp and below this a censor box showing that the contents have been passed by Tao Yuan. The red two character hand-stamp reads "Registered" and the boxed red hand-stamp shows that the letter was handled by the 4th Military Post, presumably they transferred the letter from Jiamusi to Mudanjiang. This mail is likely to come from a low ranking army member, officers were allowed to send letters free of charge, whereas the lower ranks were limited to cards. The postage is correct, the 4f letter rate plus registration at 8f. 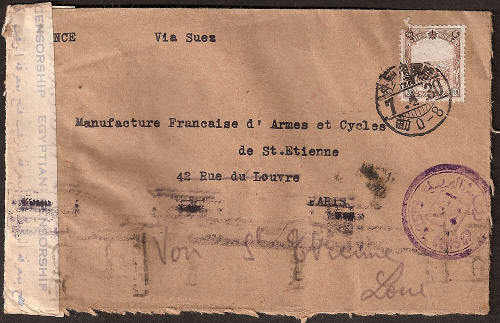 This cover is interesting because it shows that a letter posted on 30th May 1940 to a bicycle dealer in Paris travelled from Harbin via Suez an unusual route. The postage is correct at 20f. The reverse side of the letter which can be seen here, shows that it was intercepted in Egypt and sent to Cairo to be censored. A transit postmark for Cairo is dated 8th November 1940 almost six months after leaving Harbin. The Italians invaded Egypt in September 1940 and this is a probable reason for this letter being opened and censored. The letter appears to have reached Paris but a note in pencil "non St Etienne" shows that the Company had moved. There is no arrival postmark for Paris so the total transit time is unknown. This is a registered cover posted from Liao Yang to the Sumitomo Trust Co in Osaka, Japan. 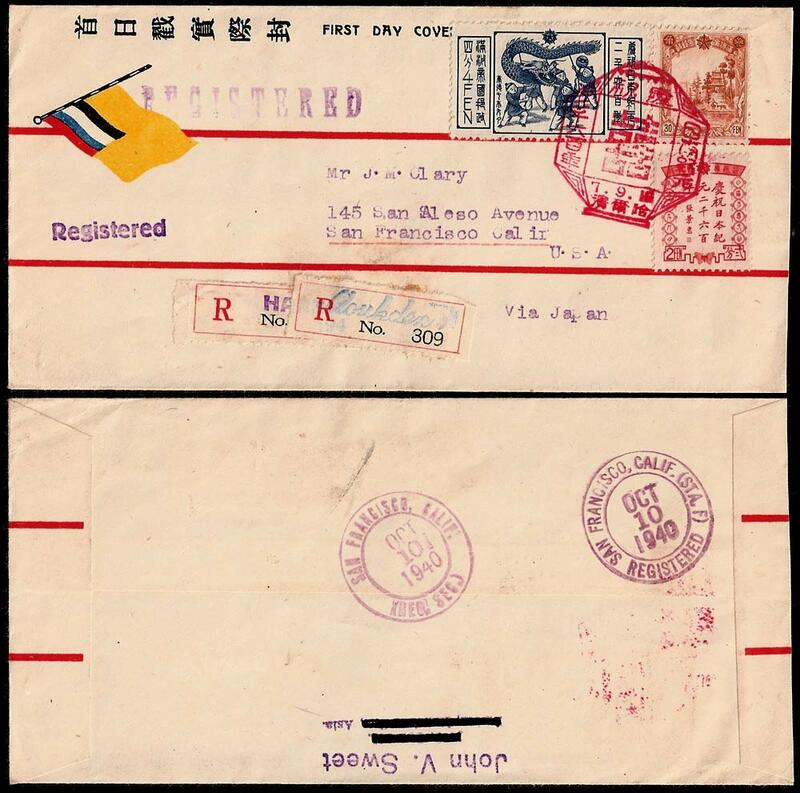 The cover has a red boxed "Registered" hand-stamp and a blue registration number 遼陽823. The cover has a single 12f stamp, 4f letter post to Japan and 8f registration fee. The postmark shows that the letter was posted in Liaoyang on the morning of 12th July 1940 and the circular red Sumitomo Trust Co dater shows that they received the letter on the morning of 17th July 1940, a transit time of 5 days. 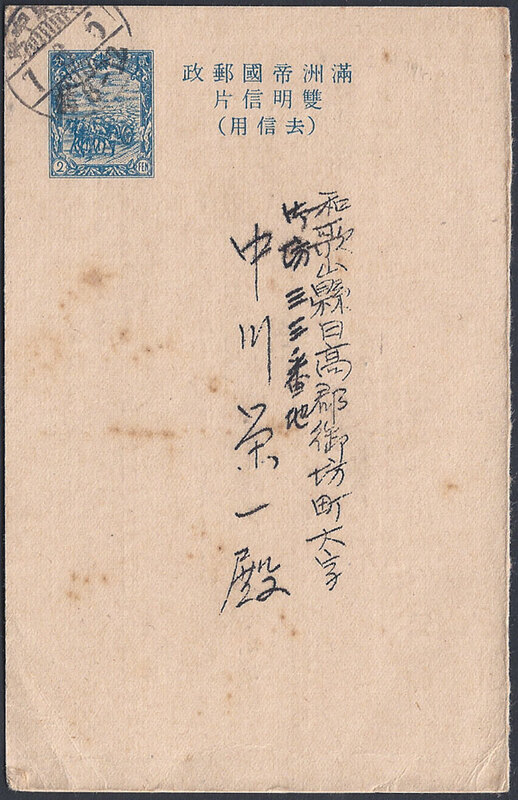 This is a domestic cover and the registration shows it was sent from on 26th June 1940 with a commemorative cancel reading 皇帝陛下訪日紀念 Commemorating the Emperor’s Visit to Japan. 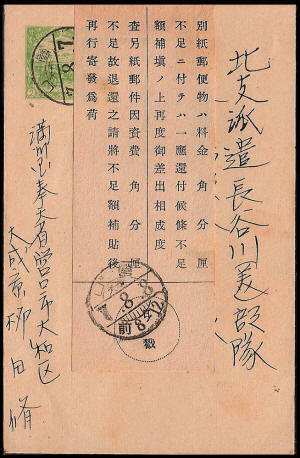 The cover is addressed to 济南城内西基文街一号 (Jinan city area West Base (?) Wen Road No. 1). Jinan is a Chinese city in the south, in Shandong area. Receiver is 王育和先生 Mr. Wang Yuhe. The cover shows a registration hand-stamp 新京 三道街 or Hsinking, Third Street Post Office. The postage on the front of the cover is correct, 5f for the letter (the rate to China) and 8f for registration making a total of 13f. This cover was sent from Harbin in Manchukuo to Tientsin in China on 20th September 1940, an arrival postmark on the reverse shows that it arrived on 22nd September only two days later. The red commemorative cancel celebrates 2,600 years of Japanese Empire. 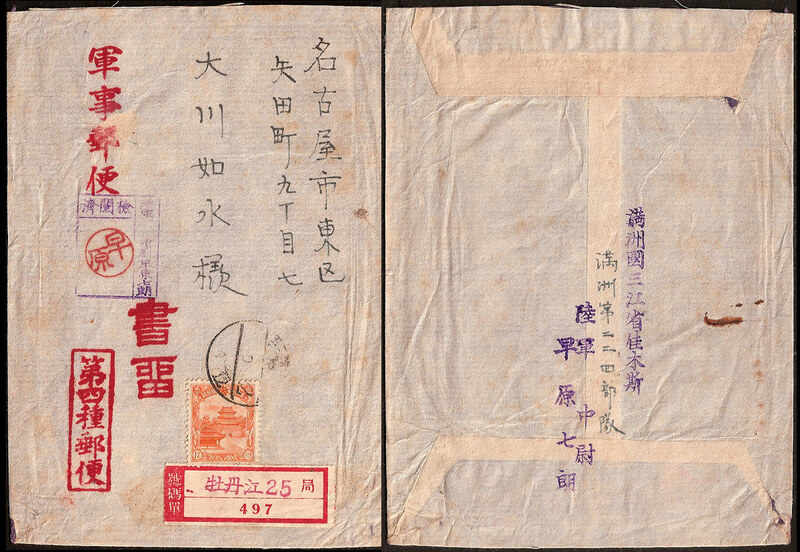 The cover shows a registration hand-stamp 哈爾濱 中央大街 043 or Harbin Central Avenue Post Office. The postage on the front of the cover is correct, 5f for the letter (the rate to China) and 8f for registration making a total of 13f. The above is a good demonstration of why stamps of these denomination were needed although a 13f China Mail stamp was available and could have been used. 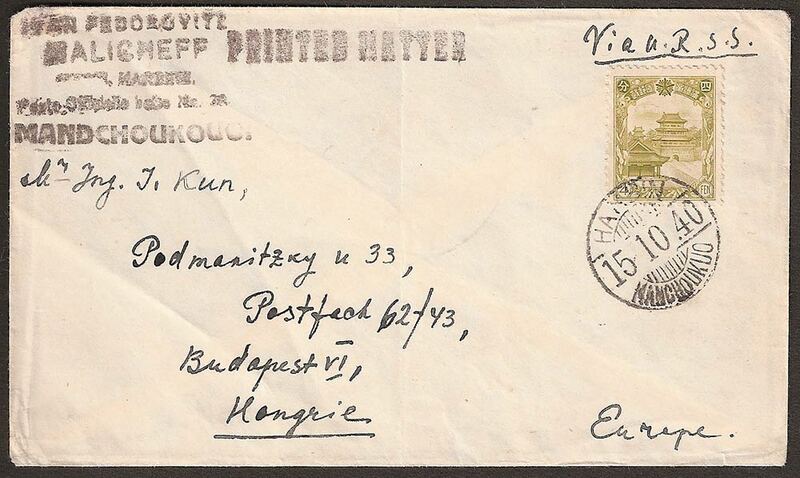 This is a printed matter cover sent by the stamp dealer Ivan Malicheff in Harbin to his customer Mr Kun in Hungary. The cover has a Harbin international date stamp for 15th October 1940 and the rate of 4f is correct for printed matter up to 50g. The reverse side of the envelope is blank. International Commercial Covers - Standard Letter Rate to U.S.A. Sent 7th December 1940 this is a standard 20g letter to America at the correct rate of 20 fen. It appears that RCA Victor had an outpost in Manchuria, probably a Japanese affiliate. 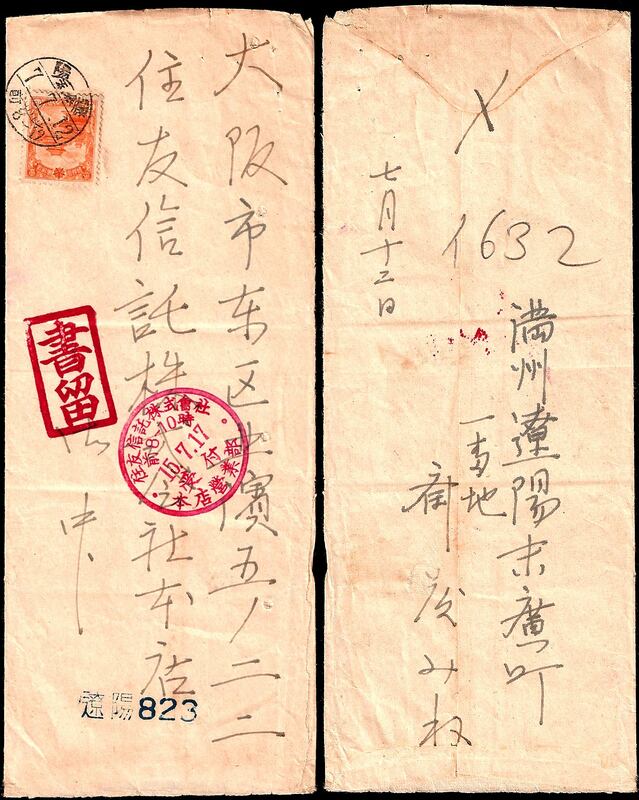 Sent 14th December 1940 from 朝陽 Chaoyang where it received a native postmark, then on to Mukden where it received an international postmark. From there to the U.S.A. The Atlee Burpee Company still exist in Philadelphia. 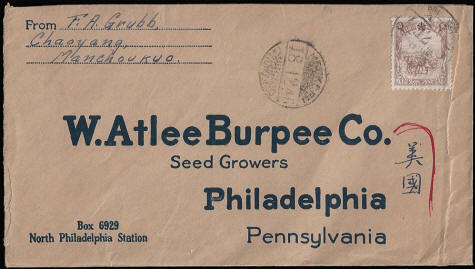 This envelope was probably enclosed within a seed catalogue along with an order form. The customer, Mr Grubb no doubt used it to send in his order for that seasons seeds. International Cover with Extra Weight and US Customs Confusion. 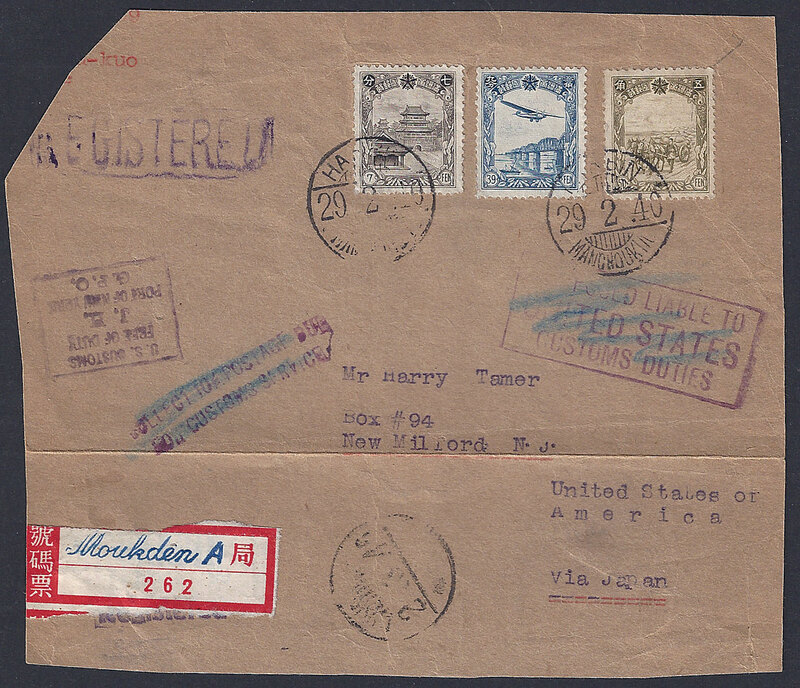 This is a part cover or wrapper sent to the stamp dealer Harry Tamer in New Jersey. This mail was sent registered from Harbin on 29th February 1940 although the number was changed at Mukden. The cover postage totals 96f. From the price charged for postage we can calculate the weight which would have been somewhere between 100g and 120g. In February 1940 the first 20g would cost 20f with subsequent additions of 20g costing an extra 12f each (x5), add to this registration at 16f and the total amounts to 96f. It is clear that US Customs were unsure about duties (no change there) and after the application of a series of purple hand-stamps decided that no duty was payable. The word Geprüft means tested in English, maybe a term for censored. 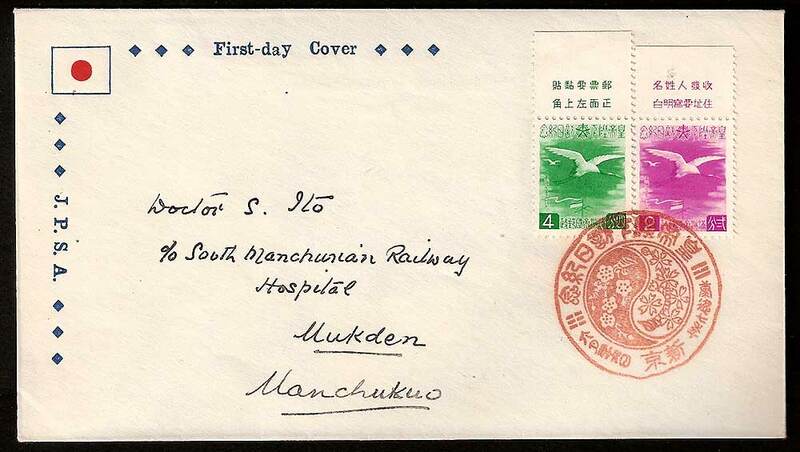 This cover was sent from Harbin on 11th March 1940 to a customer in Markneukirchen in Germany and as shown by the arrival date stamp reading 28th March 1940 the transit time was 17 days. This is a little slow as other covers I have seen indicate an average delivery time of about 11 to 13 days. The delay may have been due to the intervention of the censor. Business Documents or Business Papers was a special class of postage. The cost of posting was 20f, the same as a normal letter, but in the case of Business Papers the weight could be anything up to 250g instead of the 20g letter weight. Added to this is the 16f registration fee making a total of 36f for the correct postage. 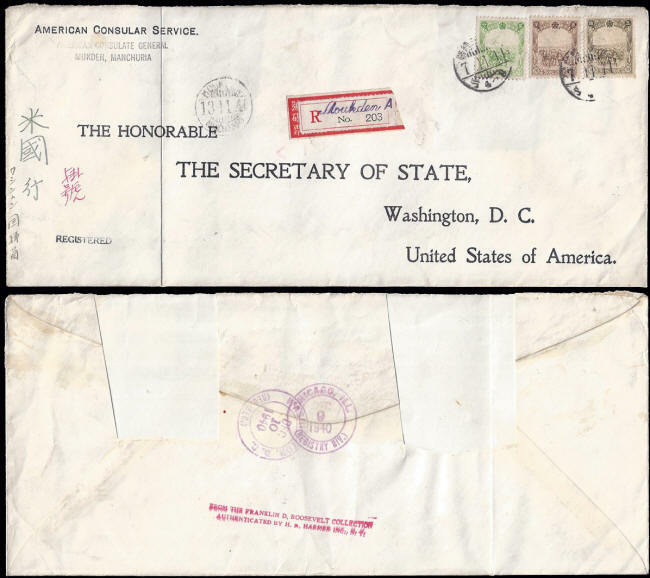 The Yokohama Specie Bank fulfilled the role of the Central Bank in Manchukuo and the red seals are typical of covers sent by that organisation. 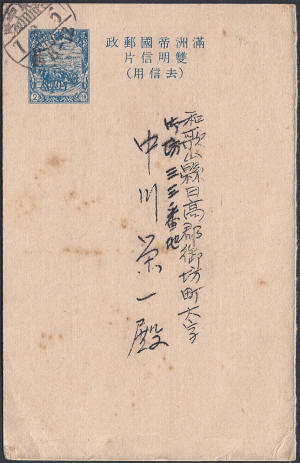 This cover entered the postal system at 三十家子 San-shih-chia-tzu on 25th March 1940 as shown by the domestic postmark and registration label number 94. When the cover passed through Harbin an international registration number 635 was added and the previous registration number crossed out. The cover carries a red 掛號 hand-stamp reading registered in Chinese and a second black boxed hand-stamp that reads registered in both Chinese and Japanese. The handwritten characters in blue 大西洋 mean Atlantic. The postage of 39f is incorrect, at this time a letter to Italy would cost 20f with an additional 16f to have it registered. Postage has been overpaid by 3f. It should be noted that this is not an airmail letter. 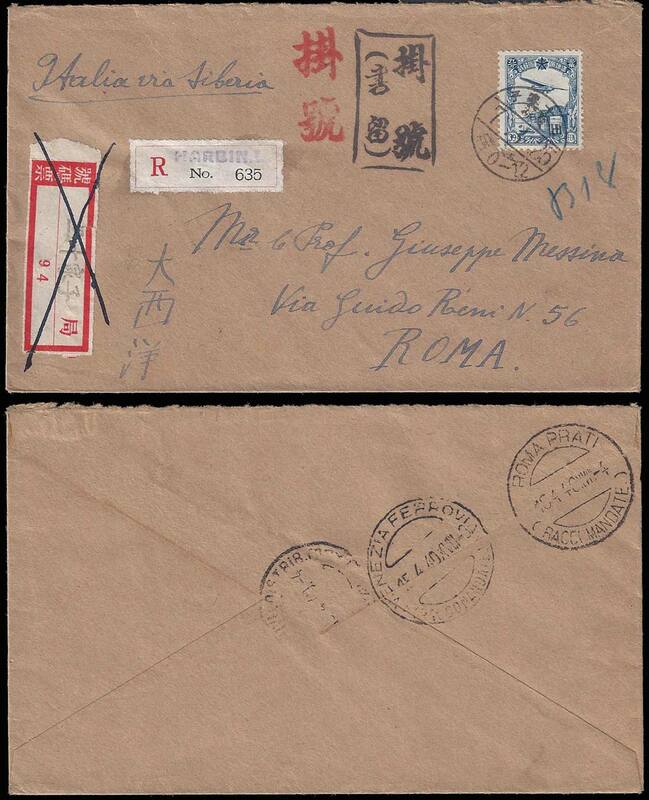 From the arrival postmarks we see that the letter arrived in Venice on 15th April 1940 and in Rome for delivery on 16th April 1940. A transit time of 23 days. 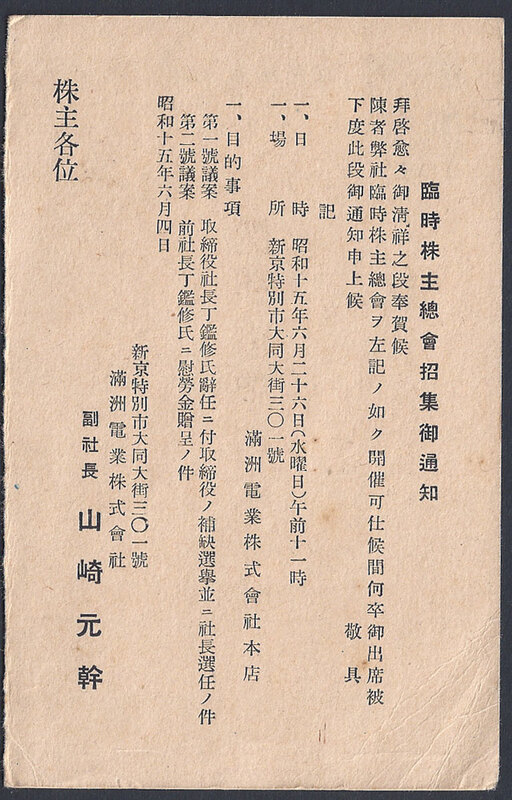 This is the "Outward" part of a reply card sent to Japan containing a "Temporary Notice by the Directors of the Manchurian Electrical Co, Hsinking" this can be seen here. 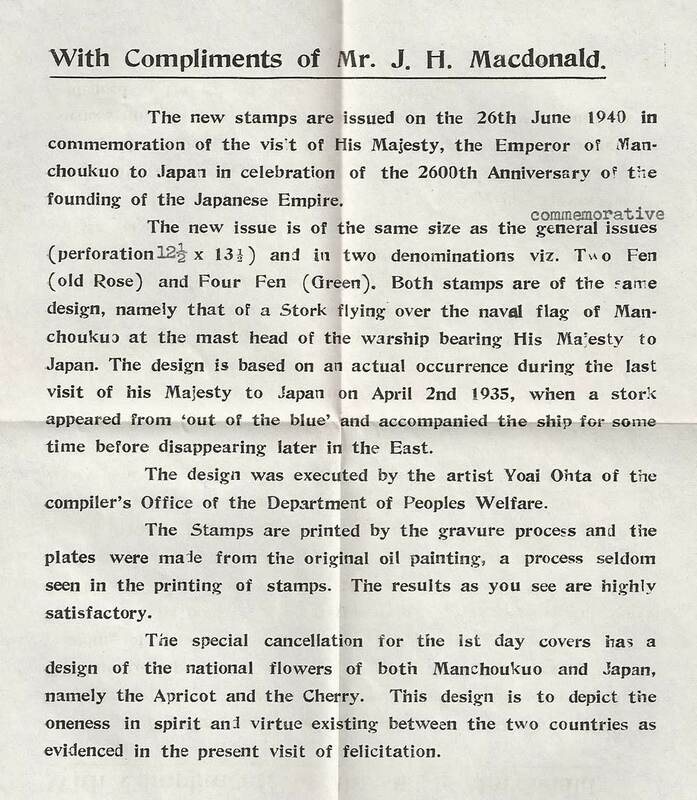 It passed through Hsinking Central Post Office on 5th March 1940and is addressed to a Mr Nakagawa in Japan. Used reply cards are hard to find as they made up a very small percentage of the postal matter and were seldom retained. In this instance the postage of 2f each was was correct for this period and the fact that the "Reply" section is missing indicates that this part was also used. 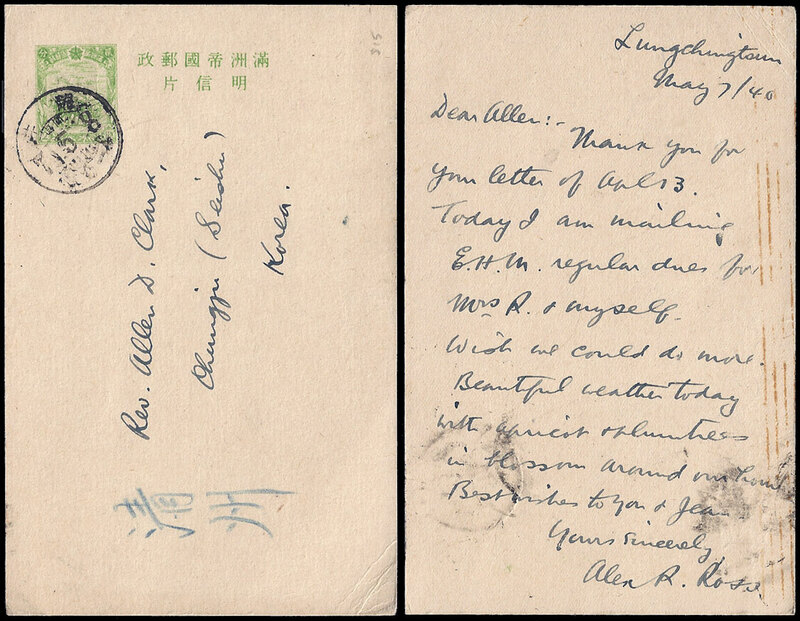 Sent on 8th May 1940 this is a postcard sent from a missionary in 龍井(村) Lung-ching-(ts'un), Manchukuo to a friend in 淸州市 Cheongju, which is now North Korea. The postage of 2f is correct for this time. A blue pencil marking 龍井has been added to guide the card to the correct town. Specially produced First Day Cover with commemorative overprint (Zirkle 50) and censor chop. This FDC came with a letter of explanation from the dealer to see this click here. 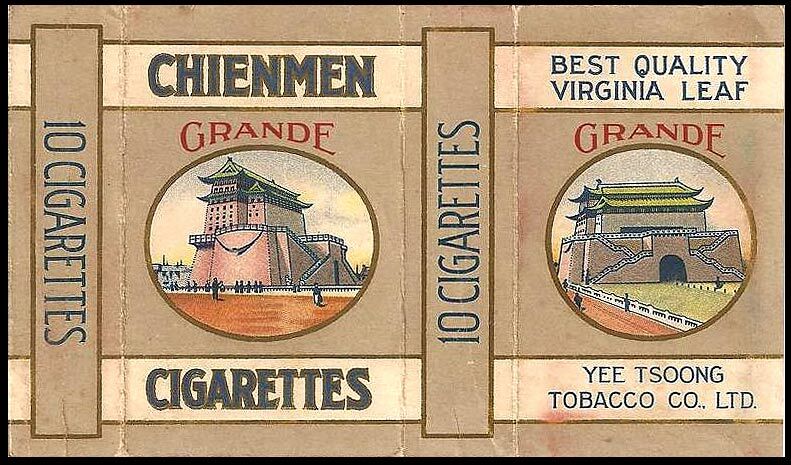 The Yee Tsoong Tobacco Co made the Chienmen brand of cigarettes. I have found no evidence that these were available in Manchukuo. The postage shown is incorrect although the purpose of the cover negates this from being an issue. The correct postage would have been 5f letter rate + 8f registration a total of 13f. This is an example of a First day Cover sent from John V Sweet of Harbin to Harry Tamer a stamp dealer in New Milford in the USA. The above cover has the correct postage, 20f international Letter Rate + 16f for registration a total of 36f. 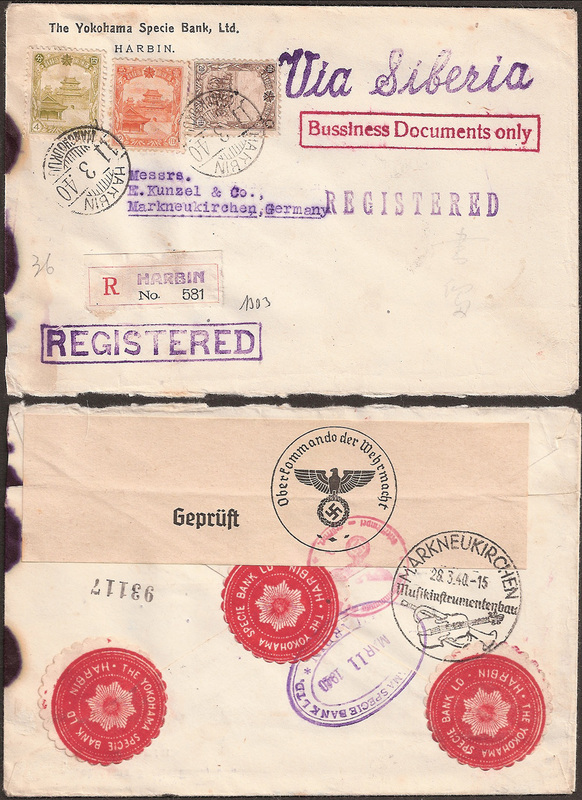 In this instance the cover was posted on 26th June 1940 and delivered on 18th July, a transit time of 23 days. This cover is almost identical to the one which featured in the December 1985 copy of Japanese Philately (Vol:40, No 6, Page 281). This article shows the cover with the registration number 416, amongst several points raised by the author is the fact that a domestic registration label is used. The correct International label carries a red "R" in line with U.P.U. regulations. These were readily available as you will see if you look at the cover below, my assumption is that the wrong label was applied by mistake. 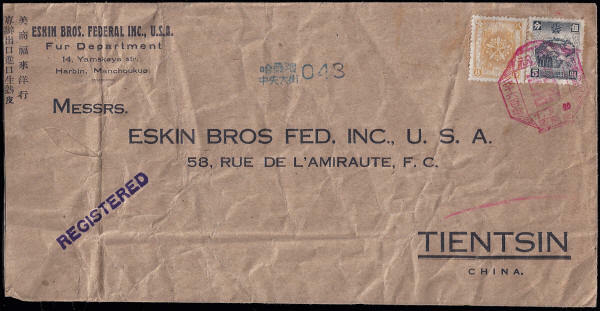 This is another example of a First day Cover sent from John V Sweet sent fro Harbin to a collector in San Francisco, USA. The interesting point to note here is the double registration label. 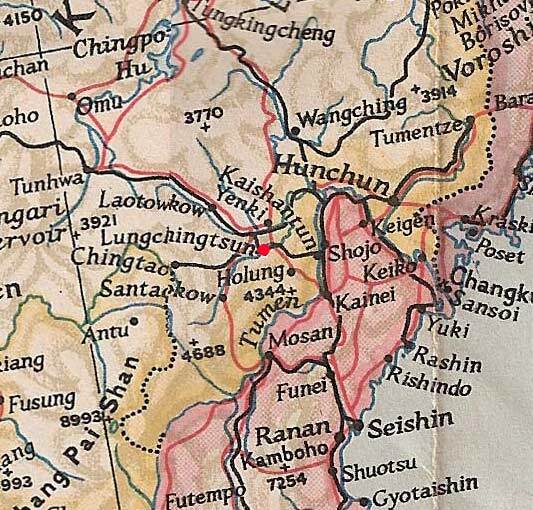 Manchukuo worked hard to impress upon the U.P.U. that their Postal Service adhered to U.P.U. rules. 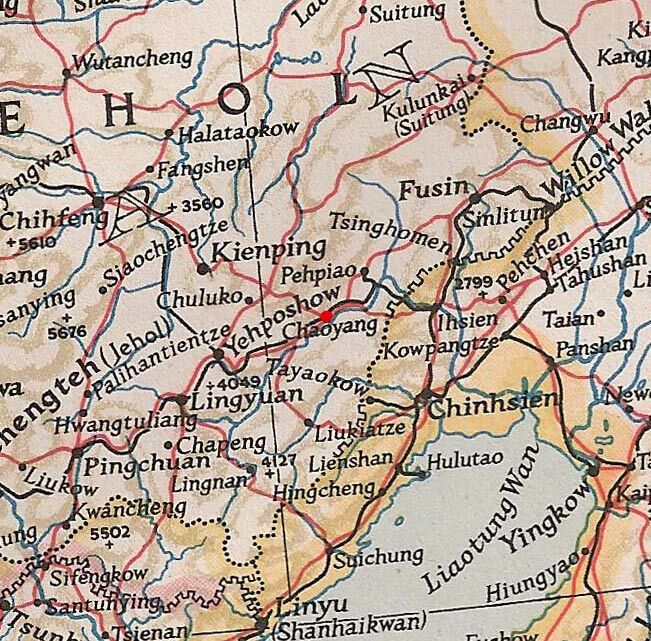 In this case however the additional registration label added in Mukden was a clear breach, as all mail was supposed to travel from start to finish using the same registration number. 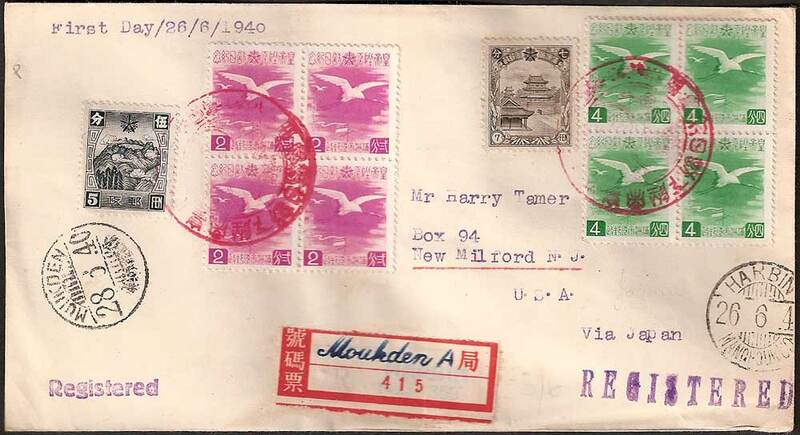 This case is not unusual, most mail (including the Harry Tamar cover above) had the registration number changed in Mukden. I have no idea why. The above cover has the correct postage, 20f international Letter Rate + 16f for registration a total of 36f. In this instance the cover was posted on 19th September 1940 and delivered on 10th October, a transit time of 21 days. I have another FDC posted to Mr Clary by a dealer in Mukden on the 20th September this also arrived on 10the October a transit time of 20 days. 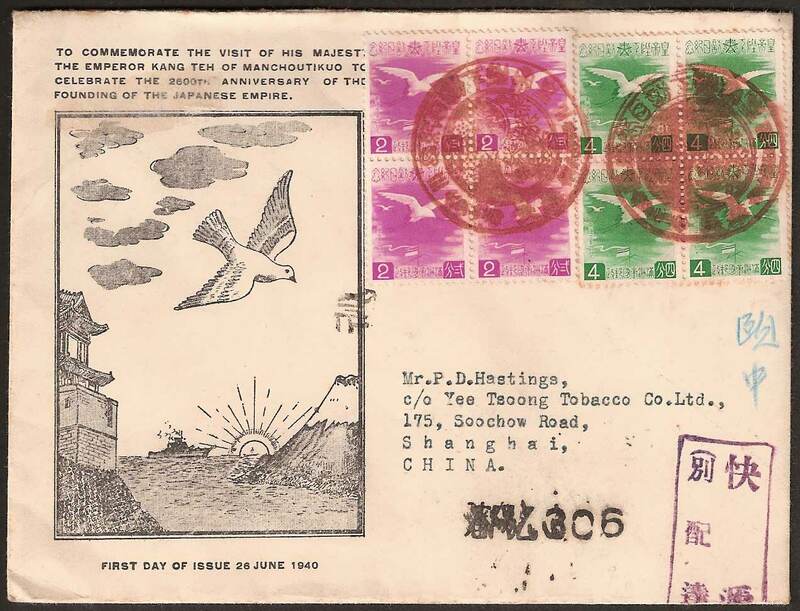 Japanese Postage Stamp Association First Day Cover with commemorative cancel and slogans. 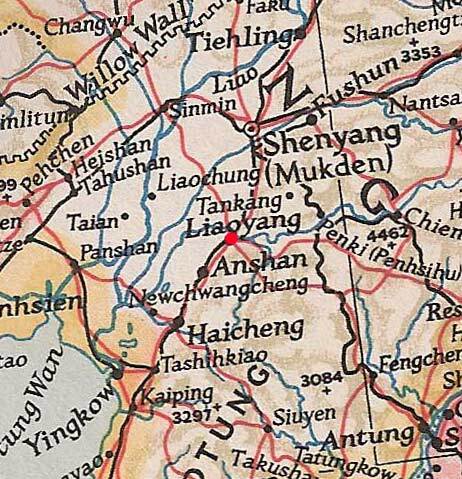 Sent from Hsinking to Mukden.